Description: the small Spinosaurus figure stands in a walking posture, with its left leg posed forward and the left arm raised, its mouth opened as if roaring and the end of the tail bent pointing to the right. Its paint job is a combination of greys and greens, the former being found on its underside (throat and belly) and top parts (most of the facial area, neck, back and upper part of the tail), the latter being located on the limbs, flanks, underside of the tail, parts of the upper jaw and all of the lower jaw. The grey and green gradually morph into each other on the parts where there would otherwise be simple overlap between both colours. The sail is dark brown (almost black on first sight). The creature's claws have not been painted. The Spinosaurus has small yellow eyes with black pupils, white teeth, a pinkish beige tongue and the rest of the mouth is all black. A black JP logo is found on both upper legs. The T-Rex stands in an active posture, its head curved to the left and its arms outstretched as if attacking something. The tip of the tail is bent pointing upwards and to the left. It has small pads on its feet to give it extra support. The animal is all coloured dark brown, except for the throat and belly which is greyish brown instead. A large number of small grey spots is found on the figure's back of the head, neck, back, very upper legs and front half of the tail. The figure's claws have not been painted. The Rex has small red eyes with black pupils, white teeth, a pink tongue and the rest of the mouth is all black. A white JP logo is found on both upper legs. Truth is, nothing does. This is total 'been there, done that' territory. Same old figures, typical super predator versus super predator in miniature mind-set, not very appealing new paint jobs. Little focus on details: unpainted claws, ugly black inside of the mouth, too little interesting skin detailing (except for the spots on the Rex maybe). It's basically a big bore, as was the previous T-Rex and Spino pairing, meaning there's also zero progress. The sculpts are still averagely decent, so you might be interested if these are new to you, but the chances of that being the case are very slim considering how often we've seen these dinosaurs already. Repaint: yes. 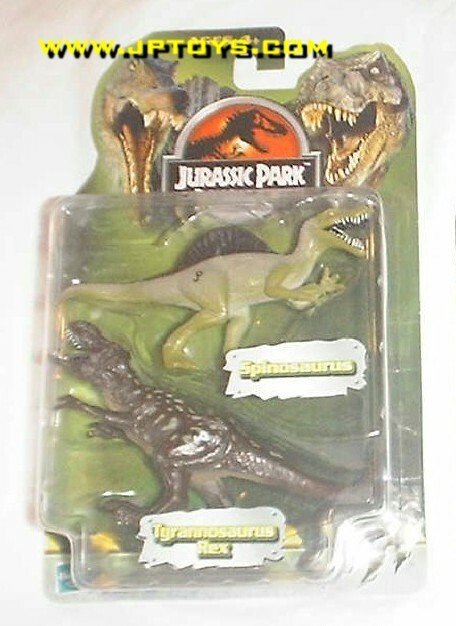 Both figures are repaints of dinosaurs that originally came with human figures for the JP III line. The T-Rex teamed up with the Military General, while the Spinosaurus came with Amanda Kirby. Both figures have been repainted before for JP III Camo-Xtreme and JPD2, and would be repainted again for this line and JP 2009. Overall rating: 3/10. There's nothing new to both sculpts, nor are these paint jobs at all interesting. Like most dinosaur two-packs from JPD2 and JPD3, this is one of the more common releases and it can still be found with little effort, usually for low prices – not surprisingly – because they're just not in high demand.